That’s what we have going on here today. Lemon lavender muffins, guys! Is this not the most perfect for spring? Also the most perfect for Mother’s Day, because Mother’s Day is brunch city, and because lavender feels like something moms like. I mean, I might be a little biased, but because of my son Afton, I think lavender anything is the best. Muffins included. I love muffins and I am admittedly aggressive when it comes to filling muffin tins. You know the conventional baking wisdom that say “only fill the cups two thirds of the way full?” Yeah, BYE GIRL. I am the special baker who likes to full her muffin tins all the way to the tippy top, and in this case, I can’t decide if it gives my lemon lavender muffins quirky and adorable little sombreros, or makes just straight up weirdo. Does it even matter, though? says the aggressive muffin-filler. The springy, relaxing, buttery taste and texture dominates. And I don’t know, guys. We might be onto something with those crispy browned edges. A word about lavender. I have never used it before other than in my pre-bedtime essential oil routine (which is mostly: rub oil on my wrists and goodnight). This is my first time using it in FOOD! Exciting, right? I tried to do some research in this area, mostly to answer the question: do people EAT lavender, like the actual little buds? And also, how exactly does one locate and buy lavender that does not cost your life’s savings? Most people would find straight lavender a little *too much* in the flavor department to just eat straight, so as I learned, infusions are a good way to go. Alternately, if the word infusion in the context of cooking gives you nervous and un-confident feelings, you can just use a very small amount, which is what we did here. We ran the sugar and lemon zest and lavender through the food processor to get it smooth (I tried the mortar and pestle – not even close to good enough, so save yourself the trouble and go straight for the big guy) and then just added that mixture straight to the recipe. I didn’t mind small flecks of lavender in my muffins, but if you did, you could just pour it through a fine mesh strainer to remove all of it. Guys, I hate to be so basic sometimes, but guess where I found my edible, affordable lavender? I love you, Whole Foods, but NOT WHOLE FOODS. Holy money bags. We bought this bag of lavender on the one, the only, the convenience-lover’s favorite, Amazon! for about $15. We used Almond Breeze Almondmilk for these muffins, and I love Almond Breeze in almost all things in my life, but I especially loved it in this glaze. It’s creamy and delicious and tastes like, um, almonds. Not fake almond flavor. Like nice, nutty, milky almonds. Imagine that. 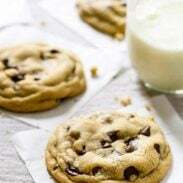 👌🏼 Just one splash with a little powdered sugar and you’ve got a yummy almond-y glaze that sets up perfectly – perfectly smooth, just the right amount of translucent, dry to the touch, and on-point sweetness. With that lemon sugar lavender crunch to top it off? Yeah girl, yeah. Pulse the sugar, lavender, and lemon zest in a food processor until smooth. The goal is to break down the lavender. Set 1/4 cup aside. Beat the 1/2 cup sugar, butter, and eggs until fluffy. Beat in honey, almond milk, lemon juice, and vanilla. Stir in dry ingredients gently until just combined. Pour the batter into a prepared muffin tin (I just greased mine, no liners). Bake for 20 minutes or until golden and the tops spring back when you touch them. Whisk ingredients together for glaze. Pour a spoonful over the top of each muffin and sprinkle with reserved sugar. If you want to make this totally dairy-free, you can use your favorite butter substitute. If you are sensitive to the flavor of lavender, use one teaspoon instead of two, or put the sugar mixture through a fine strainer to remove the larger pieces of lavender. Don’t overfill the muffin tins unless you want goofy little tops like mine have. 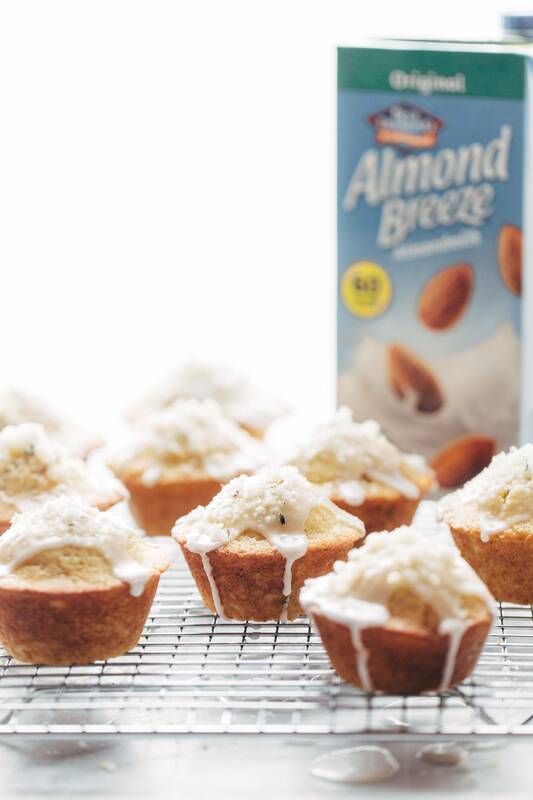 Thank you to Almond Breeze for making these muffins a reality! Oh no! I sooo want to do this, but this lavender is going to take some investigation to find in Pakistan. I don’t want to link to it because I don’t want to be blocked by spam, but a google search brought up “Ustokhuddus Ki Chai” and it looks like a close match to what you used, but they’re saying it’s Lavender TEA. Should I try it? ooh actually, I totally think you could use that! but maybe I wouldn’t put it actually in the recipe in case it tastes weird, but just brew some tea really strongly and then add that to the recipe. you could swap some of the liquids for the tea concentrate! agree! big muffins for me!! So, could you use a lavender essential oil for this, I haven’t tried using EO’s in cooking but I know some people do? lol – I love that idea of a little toothpick swirl! LOL, I read these comments and giggled. I put in 10 drops of Lemon EO (instead of zest) and 4 drops of Lavender EO in addition to 1+ tsp lavender from our garden. I also use Young Living vitality oils in my cooking and am drooling over these muffins! I grow tons of lavender so I’m thrilled I have what I need for the recipe. And I don’t think you could get a better combo than lemon and lavender although I’ve never tried! Really excited about trying the Almond Breeze for the glaze!!! I usually just use Almond Breeze in my smoothies so this is new territory. Nice. yep – that glaze was creamy and dreamy! OMG!!! My first lavender buds are blooming as we speak! I’ve been wanting to try out lavender in recipes, and since muffins are pretty much nature’s perfect food….I think I’ve found my first recipe to try. Thanks for your fun recipes and lively stories, Lindsay. Yay! I’m so glad! Thanks Patty – hope you like them. recently i had lavender goat cheese icecream and it was amazing! i love all things lavendaer so definitely have to give this combo a try. ohhhhkay that sounds so incredible. PLEASE do more research before you use essential oils internally. Yes, people eat lavender buds (not from the wild because you don’t know about pesticides, but from sources that grow it without pesticides). BUT, essential oils are highly concentrated….in fact, it take 200 to 250 POUNDS of lavender buds to make 16 ounces of essential oil. It can be very dangerous to eat essential oils because of this high concentration. Please do your own research (but NOT from a company trying to sell you oils). Lavender buds designed to be eaten are not dangerous (so long as you don’t eat 200 lbs, lol). Hi Carol! Thanks for the information. Thankfully this recipe uses the lavender buds! Young Living has a vitality line of EOs which are intended to be used internally. I wouldn’t use any other EOs, especially not internally. This is the perfect warm weather baking recipe! Thanks Josh! Hope you like it. I can’t use almond milk (nut allergy), can you substituted with cow’s milk? Same measurements? Thanks!!! right there with ya, girl! Do you think this would be good without lavender? I haven’t gotten on board with the floral food trend but I would love a great lemon muffin recipe! Most have so much sugar in them! I do. 🙂 And I think you could reduce the sugar even further if you wanted. Do you really want to be using & promoting this product? Why not use regular milk or soy milk which is legit and has some nutritional value? Hi Linda! This almond milk is actually made from an average of over 50 almonds per half gallon. Hope that helps clear up any misunderstandings. Also, could I substitute something (honey, maple syrup?) for the sugar in this recipe? If so, what amount do you suggest? I’ve had some tummy issues lately so I’m trying to stay away from actual white sugar. Thank you! I have one too! It’s so cute. And yes, honey was so good with the lemon and lavender! Baking-wise, I don’t know how it would affect it, but flavor-wise would be awesome. Is it possible to use lavender essential oil in lieu of the dried buds? I want to make these ASAP, they look beautiful! good question! I do not know enough about essential oils to know if they are safe to cook with. But if you have one that is food safe, I would think that should work just as well! These look like pure bliss. I am absolutely in love with the lavender and lemon combo! Love this combination of flavors! I’ve never baked with lavender before and this makes me want to try it. Thanks for doing the lavender research for me! I was just getting ready to do that for my newest lavender tea and lemonade recipe. Just ordered from Amazon via your link. But I will make an infusion with it since it’s a beverage. I haven’t tried your recipe yet but I always fill my muffins over the top. I’m wondering if you could take the lavender flowers and infuse them with the butter by just melting the butter with the lavender , strain the flowers out and then add the lavender infused butter to the recipe? We’ve never tried, but it could work! Only issue might be that the butter should just be softened when it’s mixed with the sugar, not melted. I have no lavender buds but I do have tiny rose petals that are for culinary use. what do you think? Hi Suzi! We haven’t tried so can’t really say. If you give it a try, we’d love to hear how it goes! You mention lemon zest and juice, but there is no reference to adding the juice in the instructions. I made the muffins without lemon juice and they taste good, but can’t help but wonder…..
Hi Judy! The juice is added in step 3.